Plant-based Mexican cuisine in southwest Las Vegas. 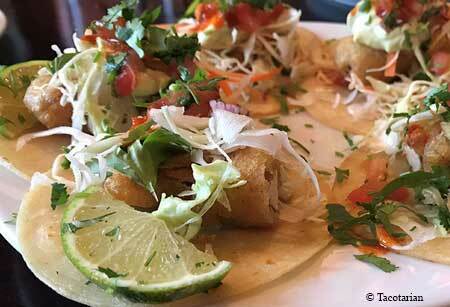 Open daily from 11 a.m.-10 p.m.
: Tacotarian in southwest Las Vegas serves plant-based Mexican cuisine. Décor elements include black, white and aqua-blue tones; vintage Mexican movies projected onto the walls; handcrafted wood tables; tile from Mexico; and a long communal table. Executive chef John Simmons has created a menu including street tacos in a dozen different vegan variations, such as carne aside (with seitan and vegan Worcestershire sauce), barbacoa (mushroom, jackfruit, barbacoa marinade, onion and cilantro) and Baja (battered avocado, slaw, cilantro lime dressing and guacamole). For dessert there’s arroz con leche (rice, cinnamon, coconut milk and strawberries), paleta (Mexican popsicle) and concha loca (handmade Mexican pastry filled with vegan champurrado chocolate ice cream from Las Vegas’ Nourish Creamery). Guests can also enjoy wines by the glass; classic and seasonal margaritas; and plant-based beer, like Tacotarian Lager, developed by the Local Craft Beer brewery in Tehachapi, Calif.